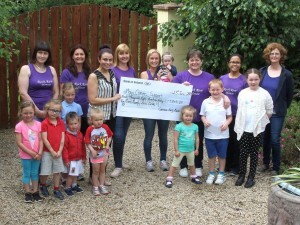 Huge well done to all of the Family and Friends of the Late Cathriona Kelly who recently took part in the West of Ireland Mini-Marathon in Memory of Cathriona and raising a substantial figure of €9,845 for Mayo Cancer Support, Rock Rose House which provides support to people living with Cancer, their families and friends. We greatly appreciate all of your wonderful support to our organisation. Pictured above are some of Team Cathriona presenting a cheque to Trisha Greavy, General Manager of Mayo Cancer Support, Rock Rose House.